And nervous. But far more excited! A few weeks ago, I received a message from a local running friend, asking me to work with her in opening up a running shop. Whoooaa….what? So, I already work full time. I work part-time at the gym, my kids are getting busier with their activities. Do I even have time? But working in a running shop, geared mostly toward women? This is such an awesome opportunity, so I said yes! 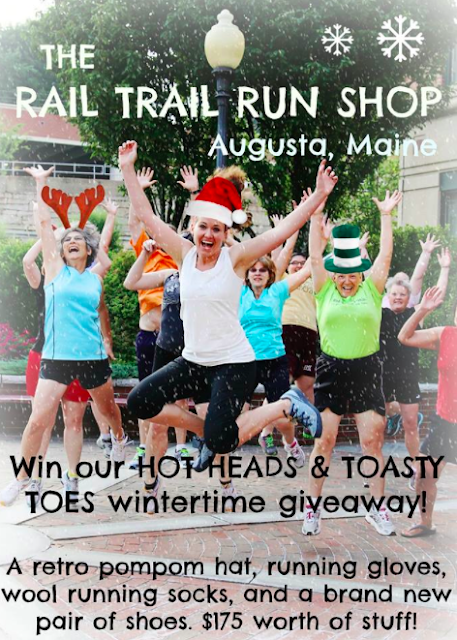 Today we are hosting our Sneak Peek at The Rail Trail Run Shop! If you live in the Augusta, Maine area - please stop by between 1:30 - 4 this afternoon. We're starting small. The shop is located in the back side of her studio at 50 Front Street, Augusta. It's tucked out of the way. For now, the area doesn't get a ton of traffic - however, the awesome rail trail, that I love running on, is going to be extended to end exactly outside the shop's doors. PERFECT! Now this probably won't happen until next year, but still….awesome! If you live in the area - please visit today! and we're starting a consignment section too! Great prices on some gently used, high end athletic clothing and gear (ranging from $5 - $12). So, onto my next venture, with a group of fantastic ladies! We're going to have a blast with this. Have you started any new ventures lately? How exciting! Wish I were closer, I'd SO be there! All the best with your new venture! Consignment is such a great idea! If I lived in Maine I would totally stop by! That sounds like so much fun! Enjoy your new endeavor. Also, I love some of the funky tights you wear with your friends. Where do you get them? wish i could have come up... ill check it out soon!! good luck! that would be a blast! I would have said yes too. So fun to take on a new adventure, especially one related to running! Good luck with it! I hope you have lots of fun with it, and meet some new running friends too. This is SO awesome, what a great and fun opportunity! I hope you love it! !